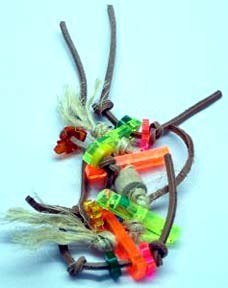 The center of this foot toy is a knotted vegetable tanned leather strip, with three 2" acrylic slats that have knotted vegetable tanned leather strips and natural sisal rope, plus acrylic shapes and several colorful wooden beads for added beak appeal. A fun, flexible foot toy that offers multiple textures. Be sure to save those acrylic shapes to use in making your own or rebuilding pre-loved toys!